If you've been following my channel, you know that I've been building a worship ministry from scratch at Mission Lakewood Church. One of my responsibilities I had was to find, build and tune a drum set for our worship band, and that's what I set out to do. When I set out to do this, I was pretty stressed because I was clueless when it came to drums PLUS I was only two days away from the preview service at my church plant. Fortunately, I have a lot of friends who’re drummers, and they helped me in this process. 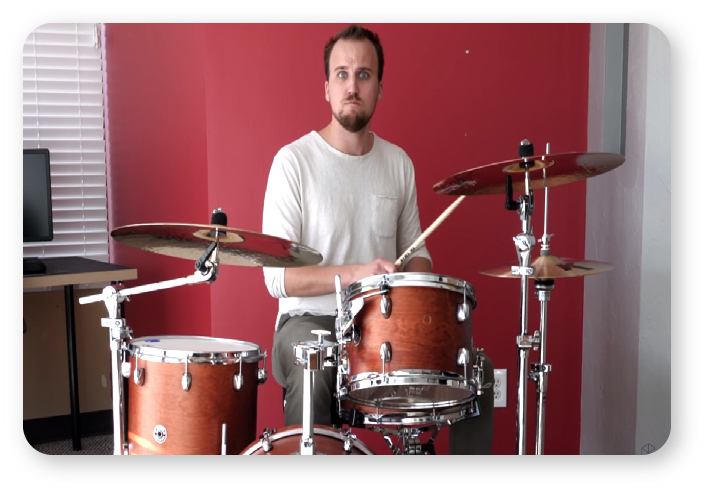 Ben Blunt at WorshipDrumCoach.com helped me find the right gear within my budget range. My friend Johnny Serano who works for Alclair, is an audio engineer and also a worship drummer. He helped me build this set and get it all tuned up, and I'm going to show you what he taught me in this article. Here’s a quick list of all the gear I used to build this. You can find more detailed info about I used all of it below. Gretsch Catalina Club 20 inch kit in a satin walnut maple. First, I needed to unbox the Gretsch Catalina Club 20 in. kit. I only wanted a small, affordable, four piece beginners kit with a snare, high tom, floor tom and kick so I went to Sweetwater.com which I highly recommend because they have great sales reps to help you out. They can usually make some special deals for you when you talk with them in person (they didn’t pay me to say that, I just love what they’re doing). In total, it this set up cost me $700-$800 and I was really happy with what I was able to find. I started unboxing the 20 in. kick and the rest of the shells. As you can see, they’ve got a nice walnut satin finish which I think looks really professional and well-done. I then opened up the snare and the 14 in. floor tom. For the snare and everything else, I took off the heads and replaced them with better ones which I’ll show you how to do below. My drummer friends recommended I get the Aquarian kick drum heads. When it comes to the other drum heads, I replaced the high tom, low tom and the snare with the Vintage Emperor by Remo. These heads are coated which give them a thicker and deeper tone and they last longer. Clear heads give you a brighter tone, but there's more resonance and high frequency sounds which my drumming friends aren’t very big fans of. When it came to the hardware (throne, the cymbal stands and all the metal stuff for the drum kit), I wanted to make sure we had some decent hardware that was solid, so I got the DW 3000 series for everything. I didn’t have a big budget and even though I wasn’t getting a $5000 DW set, I still didn't want to compromise on cymbals. They make huge impact in worship and people complain about them the most because they can be really harsh and obnoxious. I went with the Zyldjian worship pack made especially for worship music. These Zyldjian K Customs have a darker sound which means they're not as piercing or bright in worship, which is great because we want to have that full, warm, washed sound. They’re a little pricey; I think they were like $900-$1,000 dollars new, but we found a used set for $700-$800. If you dig, you can also find a good deal on them as well. So like I said earlier, my friend Johnny Serano is a worship drummer, audio engineer and he also works for Alclair. He stopped by the office, helped me add the heads and tune the drums and he shared three easy steps to doing it. First, you should stretch out the heads. Tighten the heads pretty tight and then push down on them–just to get them stretched out more–and then I'll leave it for a little bit. Normally, you can leave them for a day or two, but since if you’re on a time crunch, make do with the time you have. To stretch them, press down on them gently. Keep the bottom a little looser. Keep the top a little tighter. We didn’t do anything special for the tuning, we just went by ear. Protip: Some guys tune to a specific key. You can do that, but mainly for worship drumming, you don't want to be tuning ... that's more for studio stuff, you don't want to tune for the key, you want to tune just what's going to sound good, what's going to give it more presence, give the depth that you want from a tom. As we tuned it, we just went by ear and I relied on Johnny’s expertise to determine the tuning. Turns out the drum set sounded great on Sunday for our preview and I’m really happy with how it sounded. If you're currently working on trying to build a set for your church, this one will work for you. It’s not the cheapest set in the world, but it’s a great option that can work for your budget and still give you great sound. Like a lot of you reading this, I'm at a small church plant and I know it can be tough finding all the right ministry resources. That’s why I had to stay scrappy and low-cost for worship production. Through this, I’ve compiled all the useful info and help I’ve found into one list called My Worship Toolkit. This has everything I use to get stuff done.